I am a huge fan of all the Moosewood cookbooks -- they always offer up delicious, healthy vegetarian recipes that I go back to again and again. So, when I got an email asking if I'd like to review the new Moosewood Restaurant Favorites, I jumped at the chance. As with Moosewood's other cookbooks, flavorful veggie recipes are front and center. There are tons of recipes I want to try - chilaquiles casserole, quinoa-stuffed roasted peppers, mango aioli, and deviled egg salad are calling my name! My only complaint is that there aren't many photos -- the photos that are in the book are great, and I wanted more! But, overall I loved the cookbook and couldn't wait to get into the kitchen and give it a test drive. Because we got sweet potatoes and peppers in our produce box, I decided to try out the southwestern sweet potato-corn soup first. The soup was easy to make - just chop, cook, and then quickly puree with an immersion blender. 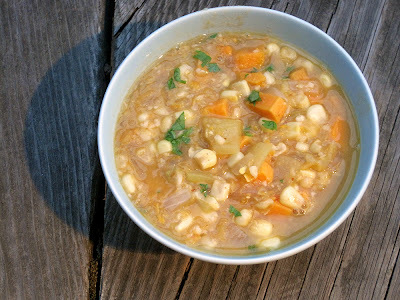 The sweet potatoes, peppers, and corn combined perfectly for a hearty but not heavy soup. I especially liked the lime juice, which is added right at the end -- it adds an extra flavor dimension to keep the soup from being too sweet. Add some cornbread on the side for a perfect supper. You can also check out some of my other Moosewood recipes: eggplant Parmesan, cardamom-chocolate chip coffee cake, orange-fennel salad, Creole fish stew with quinoa, veggie-cheese pie, ginger-y greens with tofu, ricotta-spinach calzones, stuffed squash, samosas, sparkling strawberry lemonade, and artichoke heart-chickpea stew. Yum! 1. Heat the oil over medium heat in a soup pot. Add the Aleppo pepper and heat in the oil for about a minute, stirring constantly. Add the onions, garlic, and salt, and stir to combine. Reduce heat to low, cover, and let cook about 10 minutes, until the onions are soft, stirring occasionally. 2. Add the cumin and sweet potatoes, and cook, covered, on low heat, for 4 minutes, stirring occasionally. Stir in the bell peppers, and cook, covered, on low heat, for 4 minutes, stirring occasionally. Add the corn and the water, and bring to a boil. Reduce heat, and simmer, covered, until everything is nicely tender, about 8-10 minutes. 3. Puree about half the soup, until you get a consistency you like. An immersion blender is easiest for this, but you can also use a blender - just be careful about blending hot soup! Stir in the lime juice and cilantro. Season with salt and pepper to taste. Full disclosure: I received a complimentary review copy of this cookbook from the publisher. All opinions/recipe-testing are my own. this looks gorgeous! and so perfect for right now. i don't own any of the Moosewood cookbooks, but so many people recommend them that i need to check them out. I definitely recommend them! If you lean more toward the "put lots of cheese on your veggies" end of the spectrum, I recommend the original Moosewood Cookbook -- it was written back when vegetarian diets were just becoming a "thing" and so the tendency is more toward comfort foods. The newer books tend to be a little more 'global' in the focus (though there are some international recipes in the original) and the recipes tend to be a little healthier. I love both styles of vegetarian cooking, and so all their books get a lot of use by me! Just perfect for this cooler weather! I'm constantly thinking of soup right now. Just made a curry butternut squash one this morning. I like this one of yours a lot! Sweet potato and corn - YUM!! Mmmm, curry butternut squash soup sounds amazing...may need to make one this week!